Chicago artist Krista Wortendyke is one of several artists who has been inspired by Chicago violence. Her most known piece, “Killing Season Chicago,” was created in 2010 but is just as relevant today as when it first was unveiled. 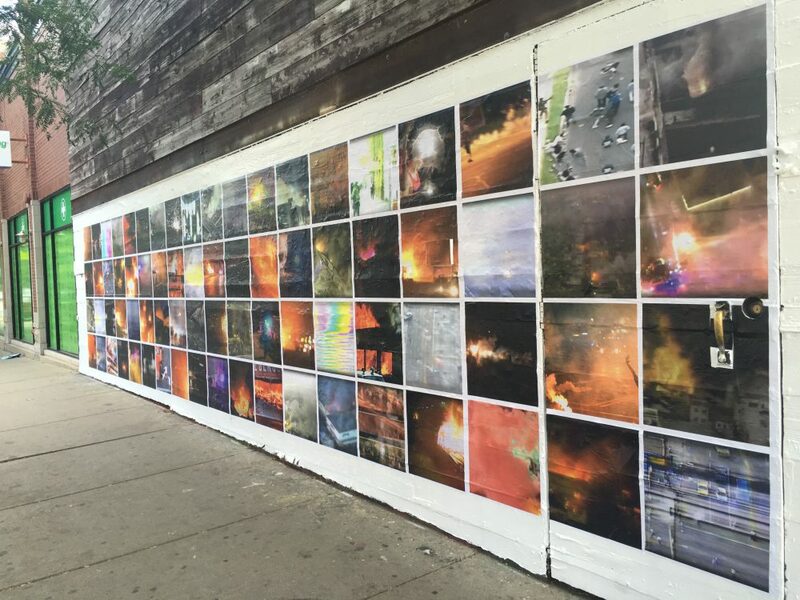 A 65-foot long wall of mounted photos in the form of a skyline, “Killing Season Chicago” consists of 172 photographs of places where homicides occurred between Memorial Day and Labor Day in 2010. The piece got its name after a few conversations Wortendyke had about a murder that happened close to where she lived. It was spring time and a common response she heard was “it’s not even summer yet,” alluding to Chicago’s season when the violence ticks upward. Soon after, Wortendyke began the project that would bring her attention and praise. Wortendyke has a bachelors and masters degree in photography and teaches photography at both Loyola University and Columbia College. Originally from New York State, Wortendyke has been living in Chicago for 12 years. For her, photography is a way to get her voice heard and to inspire conversation and debate. 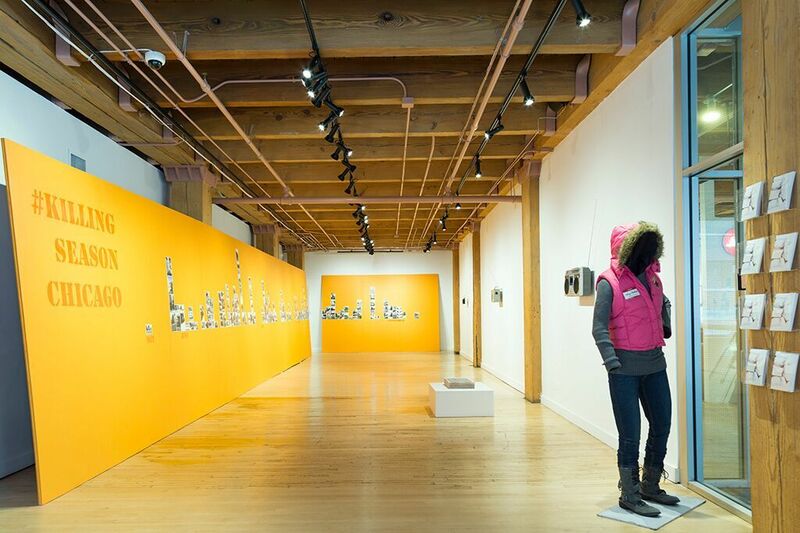 Currently, her “Killing Season Chicago” is on exhibit at at the Weinberg/Newtown Gallery in River North as part of an exhibit called “This Heat,” which addresses gun violence in Chicago. Work by fellow Chicago artists Cheryl Pope [Just Yell] and Garland Martin Taylor [Pflight] round out the exhibit, which supports the Illinois Council Against Handgun Violence. Accompanying her “Killing Season Chicago” piece are two other Wortendyke works — “Neighborhood Conflict” and “Bloodspot (Death by Gun)” on display at the gallery. She recently spoke with Bob Chiarito of The Chicago Ambassador about her work and her goals for it. Killing Season Chicago. Photo by Nabia Khan, Weinberg/Newton Gallery. CA) Before seeing the “Killing Season Chicago” exhibit, I had anticipated seeing crime scene photos. When I was there I started thinking more about it and realized that it was more powerful the way you did it. They look like normal everyday places, and they are. But they are also places where horrible things happened. Was that intentional? WORTENDYKE) One of the reasons why I started taking photographs was because a guy killed himself and his two sons near where I used to live in West Town. It was a weird experience to know that this violence happened in a place where a day later there was no evidence that it happened at all. I kept walking down that that block and tried to identify where exactly it happened but any evidence of it was gone. CA) You’re from New York but have been here for awhile now, right? WORTENDYKE) Twelve years. It really wasn’t until that year  that I began to pay attention to the media around the violence. Those days of violence that got me thinking took place in April but I didn’t start the project until Memorial Day. CA) That’s been shown at a number of places since you’ve completed it? WORTENDYKE) We’ve figured out that it’s been shown at eight different places, but it’s been different every time. WORTENDYKE) It depends on the venue. What you saw at the Weinberg/Newton Gallery it’s on large foam boards leaning against the walls. I’ve had it affixed to the walls with the orange background, sometimes without the orange. The foam boards are disposable. CA) That’s on purpose, right? WORTENDYKE) Yes. It’s the idea that something gets discarded. CA) You also have the “Bloodspot (Death By Gun)” image that patrons that take if they wish. It’s 700 news-printed images of a bloodspot on the pavement to mark the number of projected homicides in Chicago during 2016. WORTENDYKE) Yes. That image was actually the first homicide of 2013 which happened to take place near where I lived. A few days later I went to look at it and saw a big memorial and looked down and saw that I was standing in this big pool of dried up blood. It was early January and it was snowing. The interesting thing about it was that the guy who was killed didn’t have much family so that’s why it remained. Nobody cleaned it up. CA) Sometimes the City doesn’t do it well. WORTENDYKE) Did you see Spike Lee’s Chiraq? WORTENDYKE) Remember the scene with Jennifer Hudson scrubbing the blood off the street? I think it’s not as uncommon as people think. I work with some kids down in Back Of The Yards and I was talking to the kids about it, and heard a lot of stories about them having to wash blood off the streets. WORTENDYKE) That I made specifically for this show. It started as news reports from the Chicago Tribune that I started to collect. They were all matter of fact, like “this person was shot on the 6000 block of South Marshfield” and would give a name and an age and say no one has been arrested. Every once in awhile I started noticing these very beautiful vignettes that someone was writing. It was almost like they had an intern there who was a creative writer. It was obvious that they were on the scene because they were able to describe the scene with beautiful descriptions. One described a shooting in Greektown of someone who was shot while it was snowing and apparently the feathers of his puffy jacket were flying in the air with the snow and it was so gorgeous and odd. I started collecting these vignettes and I was going to do something with them but it didn’t jibe with what I was doing, so I thrashed those and turned my project into something totally different. Were you able to hear it? CA) Yes. I didn’t hear the whole thing because I didn’t know where it started. WORTENDYKE) His story is a recording but the police radio is live. It’s an odd setup where I have a compressor that is used to make Techno music. So I have one input of the kid’s story and one of the live police radio and it’s set so that every time the police radio turns on, it suppresses the kid. So you have this unpredictable back and forth. CA) How long is his story? WORTENDYKE) It’s 36 minutes. [And played in a loop for patrons]. CA) There has been a decent amount of artwork inspired by and addressing violence in Chicago. How important do you think it is to promote awareness and/or to cause change? WORTENDYKE) It’s been interesting. I struggle a lot with what my role actually is in all this. I think art is important in asking questions and getting people to think in a more nuanced way. I hope that the artwork that I make can get people to think more about things that they may not be involved with necessarily. Violence in Chicago is an interesting topic because we kind of make boxes for ourselves so that we don’t have to be responsible or it doesn’t have to do with us. We say, oh it’s the gangs. Or it’s not in my neighborhood. Or it’s an African-American problem or it’s men, or whatever. We create all these boxes so that we can stay out of it and not take responsibility for these problems. I’m trying to show it in a different way and maybe bring a little more life to it. CA) Have you heard from any victims or people who were effected? WORTENDYKE) When I was doing the project I had a blog in conjunction with it. It started with the news report and then I’d have the pictures of the place. CA) That blog is still up, right? WORTENDYKE) Yes, it is still up. A lot of times what happened is someone would do a search on Google for their family member and it would take them to my blog. I got some emails from relatives looking for more information. It kind of put me in a difficult situation because I am in no way an expert. They thought I may have known more than I did. CA) Did anyone look at it as kind of cool that you are memorializing their relatives in a way? WORTENDYKE) Yeah, I got a lot of comments on the blog. They used it as sort of a memorial way and wrote things like “This is my son. Thank you for paying attention” and things like that. I also had some crazy things like gang slurs in the comments. It was a wide range of things. CA) Did you edit any of that or did you leave it up? WORTENDYKE) I left it up. I thought about it for a very long time whether I should take it down and what my responsibility was but in the end I decided if I edited it that it would not fit the reality of what is going on and didn’t want to edit people’s reactions. I left it but I still sort of wonder if it was a good idea. CA) I’m not sure if there is a right or wrong answer. CA) One of your pieces, which is not on exhibit right now is Landscapes of War. It’s obvious that you are drawn to making social statements. Maybe I’m wrong, but I can’t see you taking baby portraits. WORTENDYKE) [Laughs]. Definitely not. I’m very interested in the way that violence is portrayed in the media whether it’s in a video game, the news, on television. I think I’m interested in it because I lived about 80 miles from Manhattan on September 11. It was really bizarre to watch this thing happen on television that was really close to where I was and then also have a friend who was killed in the attack. So since then I’ve been interested in how we experience things through media. CA) Have you heard any negative criticism? WORTENDYKE) No, not for The Killing Season. But I put it out in a public place and then I’m not around to hear the conversations, so maybe there is. There was one when I was putting it up on the facade of The Violet Hour in Wicker Park. A woman came by and thought that it was pictures of homes for sale. I told her that it was sites of homicides and she grew really angry and asked why I wasn’t putting it up in a neighborhood where it happened. That’s really the only kind of pushback I received. CA) What inspires you? Is it just things that you see on the news? WORTENDYKE) I just put up a brand new piece at the Violet Hour a few days ago that’s focused on violence again. I’m not sure why I gravitate towards that but this piece is about race riots. It’s called “Mass_Observation” and it looks like a giant Instagram feed. All the images are taken from YouTube videos of race riots from the 1960s to today. Mass_Observation, currently on display outside The Violent Hour, 1520 N. Damen Avenue. Photo by Krista Wortendyke. 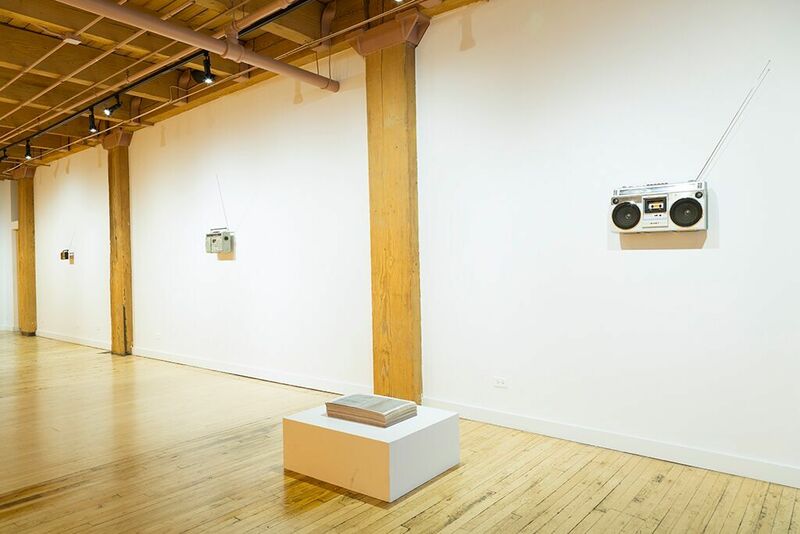 CA) “Killing Season Chicago” ends its run at the Weinberg/Newton Gallery September 24. Any plans for it after that? WORTENDYKE) Unfortunately that big, huge piece gets thrashed at the end. CA) So you remake it? WORTENDYKE) Yes. But I have another Killing Season on exhibit at Bradley University [in Peoria] and will have a bunch of stuff going on in the fall. I try to re-invent it every time. When summer comes around I try to find somewhere to put it because I think it’s important to bring it back every year. CA) Any plans to update it with new homicides? WORTENDYKE) No. I keep the dates off of it because I think it generally it speaks for any period. And this year particularly has been really heavy on the homicides. 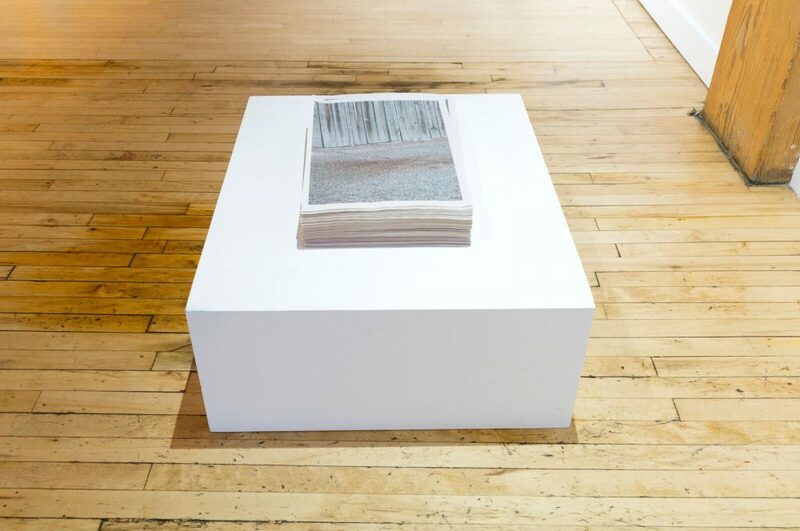 Killing Season Chicago will run through September 24 at the Weinberg/Newton Gallery.